Initial evidence indicates that Tesla did not immediately respond when the PIF initially expressed interest in the company to CEO Elon Musk. This is partially because Musk has resisted selling new shares this year, to the chagrin of Moody’s rating agency. Moody’s and a plethora of other Wall Street analysts continue to reiterate that the company should focus more on financial security than expansion. Many Tesla investors disagree. Since the Saudi state fund could not make a direct purchase from Tesla, it acquired the position in secondary markets with assistance from JP Morgan. The PIF is driving the economic diversification efforts of Prince Mohammed, who is looking to wean his country’s economy off a reliance on income generated from oil. Its operations are managed by the crown prince’s second-in-command, Yasir al-Rumayyan. Musk’s Hubris May Take Tesla Stock Private? At 2:08 p.m. ET on Tuesday, August 7, 2018, the Nasdaq halted trading of Tesla stock. 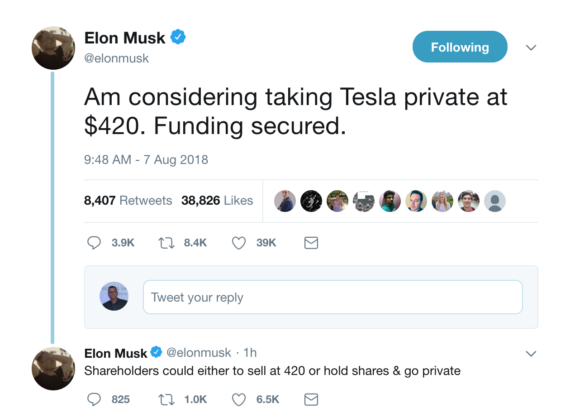 The announcement came after Elon Musk tweeted about the possibility of taking the company private at a share price of $420. The possibility sent the TSLA stock up +7.39% at the time it was halted. 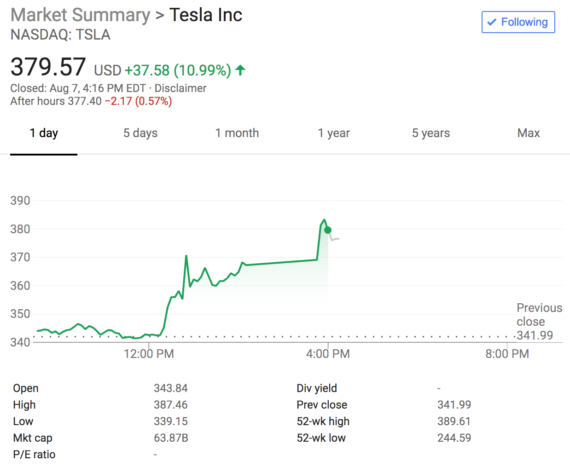 The price of $420 per share equates to a valuation of $70 billion and Elon shared that he has already secured funding to make the move. Elon shared that the move to take Tesla private would insulate the company from the rampant influence of Tesla bears and potential smear campaigns on the direction the company moves. He shared in a tweet that the move would insulate the company from some of the distractions that come with being a publicly traded company. 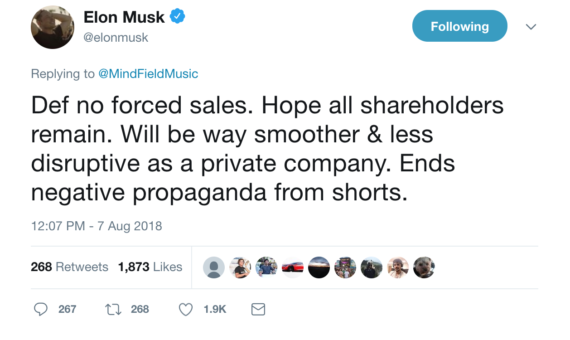 Specifically, Elon wants to ditch the noise and claims of looming bankwuptcy caused by all the shorts. In June 2018, Tesla had cash and cash equivalent reserves of $2.2 billion and Musk insisted that a positive cash flow in the final two quarters of 2018 was achievable if Tesla could achieve a stable Model 3 production rate of 5,000 vehicles per week, which was essentially 99.9% expected. On the earnings call last week, he shared that “we certainly could raise money” if needed and added that the company would instead engage in “better discipline” than to sell more shares. Will Wall Street concur that Tesla finally, after 15 years, has a financially sustainable business? Chinese internet company Tencent took a stake in Tesla through stock market purchases early last year, paying out about $1.7 billion to amass its 5% position. In addition to an investment in Uber, the PIF has made several other big-ticket forays, including a $45 billion investment in the SoftBank Vision Fund and an up-to-$20 billion commitment in an infrastructure fund managed by Blackstone. It also made a $400 million investment in March in Florida-based Magic Leap, which makes “mixed reality” headsets. In another tweet later in the day, Musk assured his vast network of followers that Tesla would remain loyal to those that had supported the company on the journey to where it is today and will go tomorrow.